Yes, it's time to celebrate the miracle of our birth! Actually we were born July 8, 2010. But our human Carol insisted on getting in the act and she was born July 5. While we feel OUR special day is MUCH more important, we realize humans are important as our PR agents! SOooo Happy B-Day to all of us! What an exciting day! Happy happy happy birthday to all of you! Happy Birthday to all three of you! Love your Birthday Card. Hope you have a wonderful celebration. 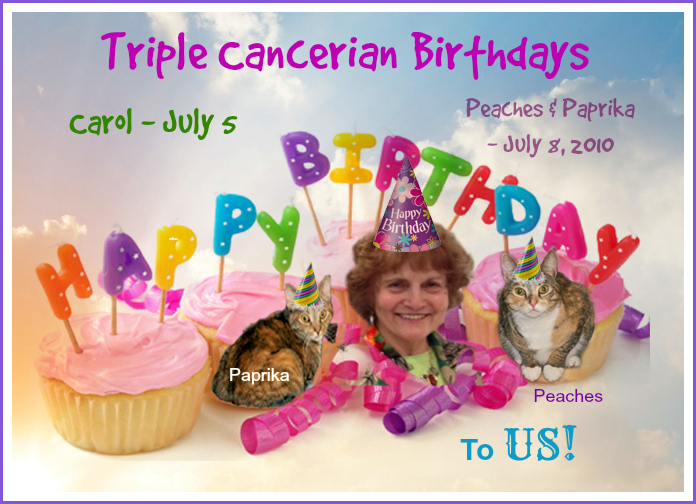 Happy Birthday to Carol, Peaches and Paprika! You should celebrate all month like Phoebe and I do :) Very cute card. Happy happy happy birthday to all three of you! Dang, now that's a special day! Happy Birthday everyone! Happy Birthday to Carol, Peaches and Paprika. Happy Triple Birthday!!! What fun to celebrate together!! Happy birthday to a trio of lovely ladies! Happy Birthday a day late to all of you. Hope you had a great day yesterday. Oh wow, we are glad we glanced at this post again, because we (thought we) had left a comment and apparently messed up in sending it. So belated Happy Triple Birfday! We are so grateful for Furrriends like U! Thank U all SOoooo much for your triple birthday wishes! We would have written to thank you sooner but our human came down with the flu. Of course we had to clean our littler pan ourselves and fix all our breakfasts. How unfair is that. A cat's work is never done! Love, your calico friends, US! Happy, happy, happy ... hugs and love to all of you! Happy Meowday and birthday to you all. Hope your day is purrfect. Belated happy birthday to all three of you. I am sorry I am so late but my mum only lets me comment on the days we post, but worse still, we have been without internet too much of the time over the past month. Mum is changing provider on Friday so hopefully it will be much better.